The Jungle Book by Rudyard Kipling, the album Nilsson Schmilsson by Harry Nilsson, and memories of time spent at a boys’ camp in New Hampshire combine in the kaleidoscopic dreamscape called Welcome to the Jungle, currently on display at Pangea. This is the latest in a series called The Living Record Collection written and performed by Salty Brine. Each features a complete classic album, performed in order (with the occasional inclusion of other songs), reinvented and reworked in combination with other stories and settings. Such high concept endeavors too often begin and end with the concept, but not in Brine’s brilliant hands. He sings well, he dances with innocent abandon, and he is a riveting storyteller and writer. He has a lot on his plate, and it is all ingeniously well served. There are moments of high hilarity, moments of intimate drama, moments of of exciting musicality, and perhaps rarest of all, moments of simple beauty in this show. I am sorely tempted to describe each and every thing that happens, but this review will remain spoiler free because I want audiences to experience this cabaret alchemy for themselves. While Salty Brine stays firmly in the center of the show, he is ably assisted by a remarkable supporting crew. I cannot overstate the contribution of director Max Reuben. The use of the full room as a playing area is particularly impressive in the small, table-packed space. 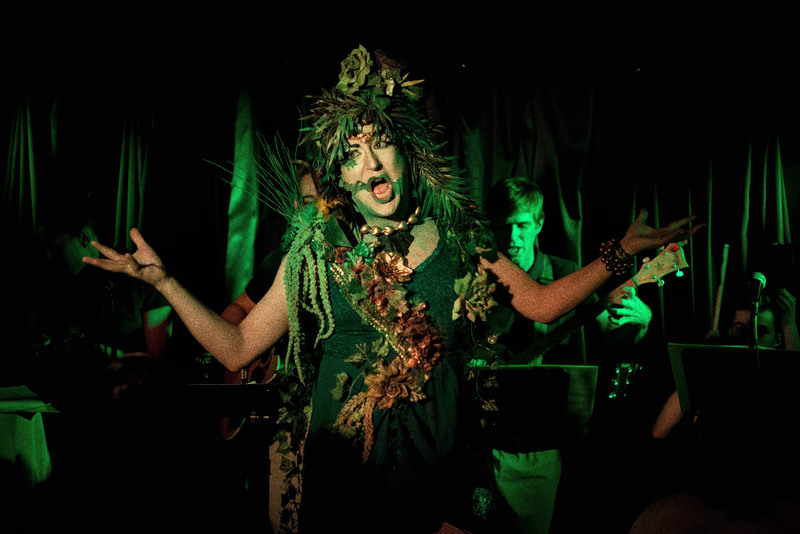 Heather McDevitt Barton has contributed a leaf-and-flower strewn-costume that is as much a set as it is clothing. Nate Weida has contributed witty and captivating arrangements. Weida, along with Emil McGloin, Shelby Phillips, Maya Sharpe, and Wes Zurick not only play multiple instruments (including piano, violin, bass, melodica, and a few banjos) but also populate the stage with a wild variety of storybook characters and youthful campers. Each song is given highly personal and wonderfully realized life. But everything comes back to, and rests on, Salty Brine. He resides at the top of the list of this new age of drag entertainers, along with BenDeLaCreme and Lady Bunny. His performance is stunning. If you wish to see an artist at the height of his powers and to take a cabaret journey like no other, you should accept his welcome to the jungle.